Though the Jumbos were unable to advance to the winner’s bracket of the NESCAC Championship this past weekend, they found a silver lining in the tournament. No. 24 Tufts fell to No. 18 Bates on Friday but bounced back Saturday to record victories in its consolation matches against Wesleyan and Conn. College with 5-4 and 8-1 wins respectively. Though Tufts came out with energy and looked to start the tournament off strong, they struggled against a solid Bates squad on Friday. First-year Hannah Burns was the only player to record a victory the first night against Bates, beating classmate Katie Bull in the third position in four games. Burns took the lead, winning the first set 11-6, but found herself on the wrong side of the scoreline soon after. She eventually recovered to take the next two sets 11-5, 11-1 to take the win and put her team up early. But Burns’ teammates did not have the same luck in coming back in their match-ups, losing in all of the next eight positions. Fellow first-year Sinclair Meggitt put on an impressive show in the seventh position as she and the Bates Bobcats sophomore Hannah Conner battled to five games. Meggitt lost the first game 11-9 before taking the next two games in extra points. However, Conner fought back and won the next two games 11-5, 11-6 to seal a come-from-behind victory and hand the Jumbos another disappointment. The Jumbos moved into the consolation bracket, determined to channel their disappointment to rewrite the story on Saturday. In its first match of the day, now-No. 25 Tufts edged No. 23 Wesleyan, delivering a 5-4 upset. While senior captain Paget Stanco was unable to defeat Wesleyan sophomore Laila Samy in the top match, losing 11-6, 11-0, 11-3, the match-ups in positions two through six delivered better news for Tufts. 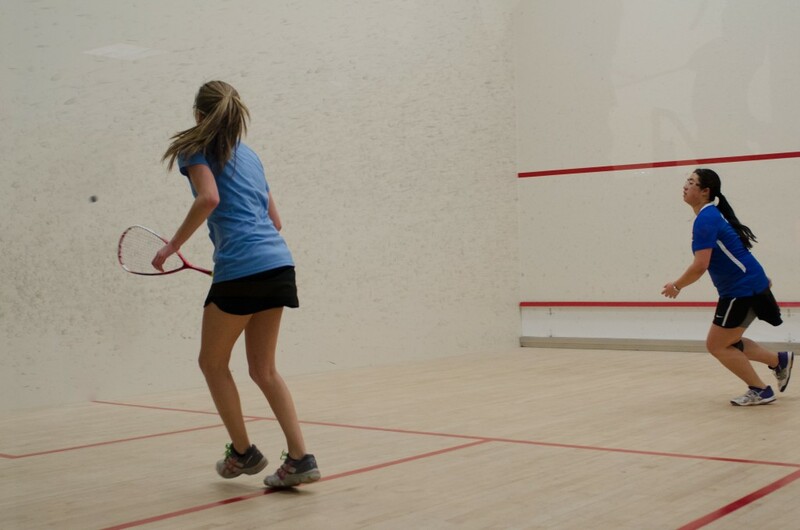 Burns defeated Wesleyan senior Bridget Doherty in dominant fashion in the third position, 11-3, 11-0, 11-4, while first-year Sahana Karthik won her match against Cardinal sophomore Tatum LeClair in straight games in the fourth position, 13-11, 12-10, 11-8. Sophomore Lauren Banner also won in straight games in the fifth spot, 11-4, 11-9, 12-10. A few other Jumbos took just one more game to get the win, with sophomore Claudia Udolf and first-year Zarena Jafry fighting off the challenge of their opponents in four games, defeating the Cardinal’s first-year Ali Imperiale and senior Liza Bayless respectively. Even with their losses, the Jumbos still made life difficult for the Cardinals. Meggitt won the first game 11-8 in a four-game defeat to junior Annie Ferreira by the scoreline of 8-11, 11-8, 11-5, 11-6. First-years Christa Irani and Isabella Libassi also took one game off their opponents despite losing. The team got even more comfortable in its final game of the weekend as it easily defeated No. 27 Conn. College. The Jumbos put in a dominant performance, winning the top eight matches against the Camels. Stanco, duking it out in the first position, defeated junior Ashley Arthur 11-4, 11-6, 11-3, while Burns defeated Aaliyah Davidson 11-6, 11-6, 11-7 in the third position. Still, the Jumbos were tested in some of these match-ups, evidenced by Karthik’s 5-game win over first-year Olivia Silverman 4-11, 11-9, 11-9, 10-12, 11-6. Banner continued her return from injury with an 11-7, 11-7, 6-11, 11-4 victory over junior Anne Holly in the fifth position. The victory over Conn. College, following up the one against Wesleyan, should help Tufts recover its spot in the rankings. The two wins to finish the weekend put Tufts at 9-7 on the season as the team now moves on to preparing for the College Squash Association (CSA) Team Nationals coming up Feb. 19 – Feb. 21. Tufts next plays Boston University (BU) on Thursday night, before taking on Wesleyan and Vassar again on Saturday, Feb. 13. These will be the last matches Tufts will play in the lead-up to the CSA Team Nationals at Yale, and they will take each game as it comes.